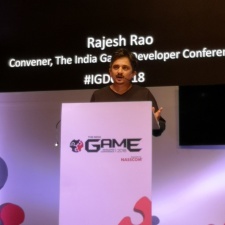 The rebranded annual India Game Developer Conference has kicked off its 2018 event with a keynote by event organiser Rajesh Rao. Previously known as NASSCOM GDC - and still sponsored by NASSCOM - the conference is now branching out on its own. Not just putting together a conference, organisers are also at work on forming an Indian games trade body, inviting all games companies in the country to join. More details are expected to be announced in the near future. Taking to the stage, Rao said reflected on the growth of the Indian games industry over the past few years. Key trends include the PUBG ‘phenomenon’ across India. The game has proven hugely popular in the country, racking up millions of downloads and proving highly lucrative too. The latter is something games in India have traditionally found tough to crack. The locally developed Ludo King by Gametion meanwhile has crossed 100 million downloads worldwide. On average it picks up 12 million daily active users. Rao noted that just two years ago, that DAU figure was ‘just’ two million, growing six-fold in that time period. It’s something he feels also reflects the growth of the games industry amongst consumers in India. “There’s every reason to believe that this industry is maturing very rapidly and this is a great time for all developers to look at India very seriously,” he said, calling out a “second wave” of older, wiser more mature games companies that are attracting more interest than ever. IGDC takes place today and tomorrow (December 4th and 5th), alongside fellow event Unite India (December 5th and 6th). Speakers at IGDC include NaturalMotion VP Julian Widdows, Avalanche Studios game director Francesco Antolini, Nazara Technologies CEO Manish Agarwal and Geogrify CEO Kate Edwards, to name a few. The show also houses an exhibition for games companies across India and later today will host the IGDC Awards ceremony. PocketGamer.biz was represented on the judging panel. We'll be reporting from the show over the next few days to provide a closer look at the Indian games market.